Yesterday was my day to run 18 miles. The day started a little earlier then planned again thanks to my two male huskies. It always seems like it is one of the males that wakes me up, may be my female, Zoe, understands a girl needs her beauty sleep. Anyways, was planning on getting up at 5:30am so I could get the 18 miles in by 10am so I had a little down time before our family get together in the afternoon. Well Chico, the oldest male, moved around and did something to shake the bed and woke me up a little after 4:30am. I decided just to turn over and go back to sleep but Phoenix was right there with his nose in my face, staring at me. Oh, the joys of having dogs. Well, decided to just go with getting up early and headed out on the run around 6:30am when it was about 28° outside. I really don’t like getting up early but I do enjoy having the streets mainly to myself when I run. Just when I hit the four mile mark I head into a local park where I run about 5 miles of my run. As the sun was starting to rise quite a bit I came along one of the ponds in the park where the ducks mainly stay the most. 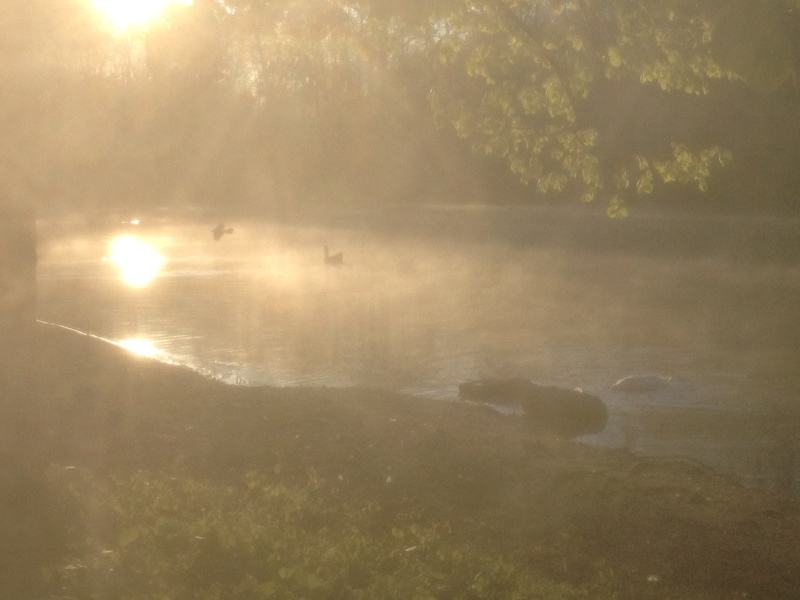 There was a mist over the water and the sun was coming up over the trees. I tried to get a few pictures with my iPhone but they didn’t really do it justice. Here is one so you at least get the idea. The rest of the run was pretty uneventful (which is usually good). When I finished it was about 50°. Quite a temperature change! Had my smoothie, 45 minute nap, walked my dogs then off to Cincinnati to celebrate Easter with my family. It was a long day! I was knocked out last night. Less than three weeks away until the Derby Festival Marathon! Overall pretty excited with an occasional thought of why am I running 26.2 miles again? This entry was posted in Marathons, Multiple Sclerosis, Running, Uncategorized and tagged Marathon Training, MS, Multiple Sclerosis, Running, Training. Bookmark the permalink. It seems to be cool where you are but do you ever overheat? I also run (and have MS) and overheat when the temperature is 55 degrees or warmer. It’s only this cool right now because it is the spring, in the summer the coldest it may get at night is 70s or even 80s. I do have issues with the heat but it doesn’t always come at a certain degree. I usually have issues in the 80s or higher especially if it is humid. If its really warm I have to try to start my long runs around 6:30am. You are an inspiration! While I have a few years on you, and don’t plan to run marathons, I am very active and am quite happy with 5K’s. I was diagnosed with MS last year and it has thrown me for a loop. Things are SO much better than they were a year ago, and I’m intent on keeping that way. For now, interferons is where I’m at, but whatever works, I’ll do. Meds definitely help my right side…life would definitely be tough without them. Anyways, I have never posted to a blog, but couldn’t resist as yours seems to be about your journey forward and I so admire that. Keep running! Thank you! Most people are amazed if anyone can run a 5K so those are definitely an accomplishment and something to be happy and proud of! Glad to hear things are getting better for you, it does definitely throw you off track for a bit. You keep running as well!